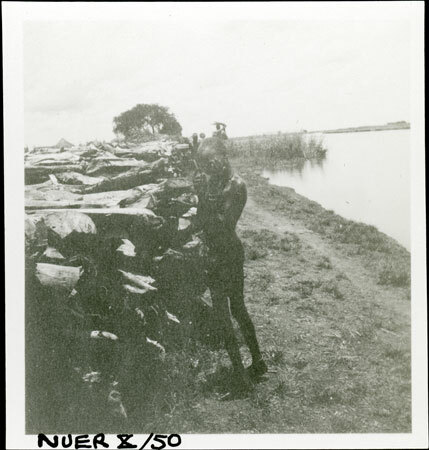 A dark image of a youth with hands raised to his face, standing next to a large woodfuel pile for steamers on the Sobat River. Accession Book Entry [p. 98] 1966.27 [1 - 24] G[ift] PROFESSOR E. E. EVANS-PRITCHARD; INST. OF SOCIAL ANTHROPOLOGY, 51 BANBURY RD. OXFORD 1966.27.1-16 S. SUDAN. NUER TRIBE. Sixteen negative albums containing negatives and prints of photographs taken by donor during field-work. All listed in albums. Added Accession Book Entry - [p. 98 in right hand column, in pencil] Catalogue room. Note on print reverse ms pencil - "04 2" & print front border ms ink - "NUER X/50"
Morton, Chris. "Sobat River woodfuel station" Southern Sudan Project (in development). 03 Jan. 2006. Pitt Rivers Museum. <http://southernsudan.prm.ox.ac.uk/details/1998.355.473.2/>.